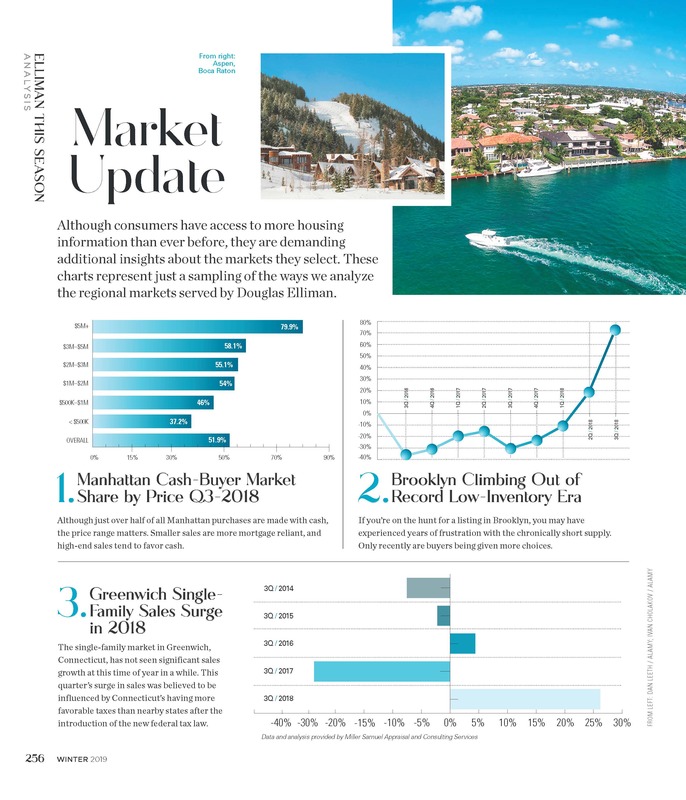 The Winter 2019 Issue of Elliman Magazine was just released. 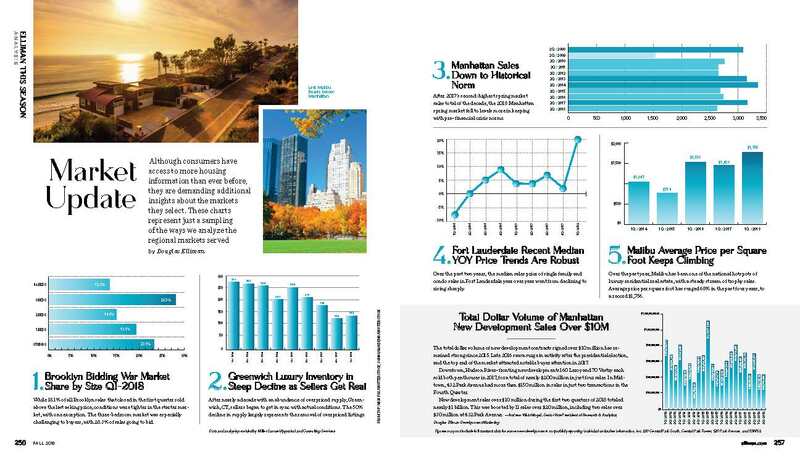 I provided a two-page spread showing various market tidbits on random U.S. markets where Douglas Elliman has a footprint. The magazine is well done and a good aspirational read. 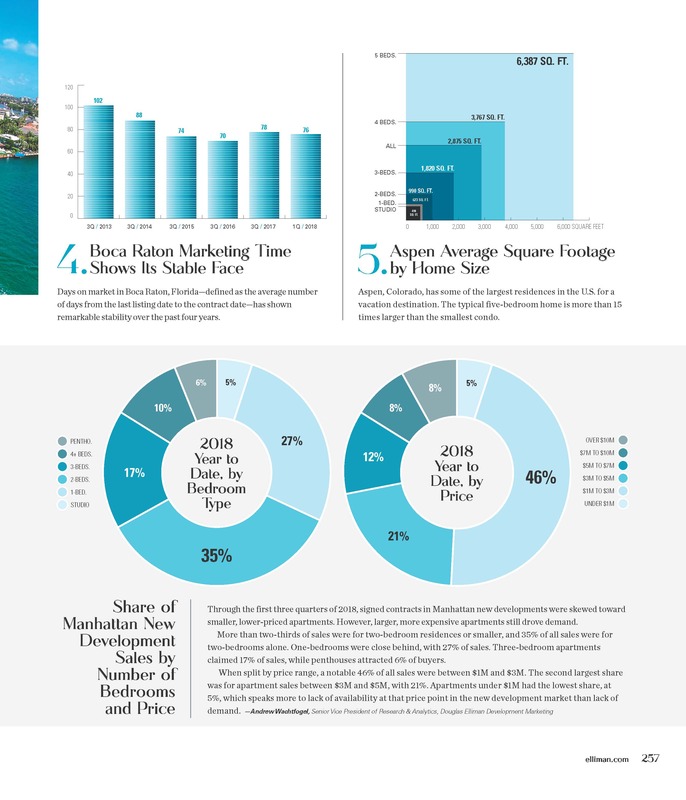 The Fall 2018 Issue of Elliman Magazine was just released and as usual, I provided a two-page spread showing interesting (my definition, lol) of what is going on in some of the markets under their national footprint. The magazine is well done and a fun aspirational read. 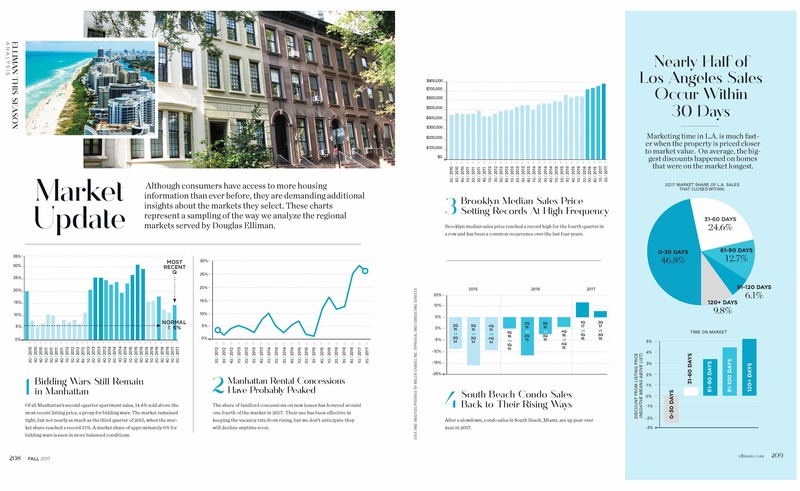 Douglas Elliman Real Estate just published their fall issue. I created the content for pages 208-209 and I think it looks pretty snazzy (and interesting). Click on image below to expand. 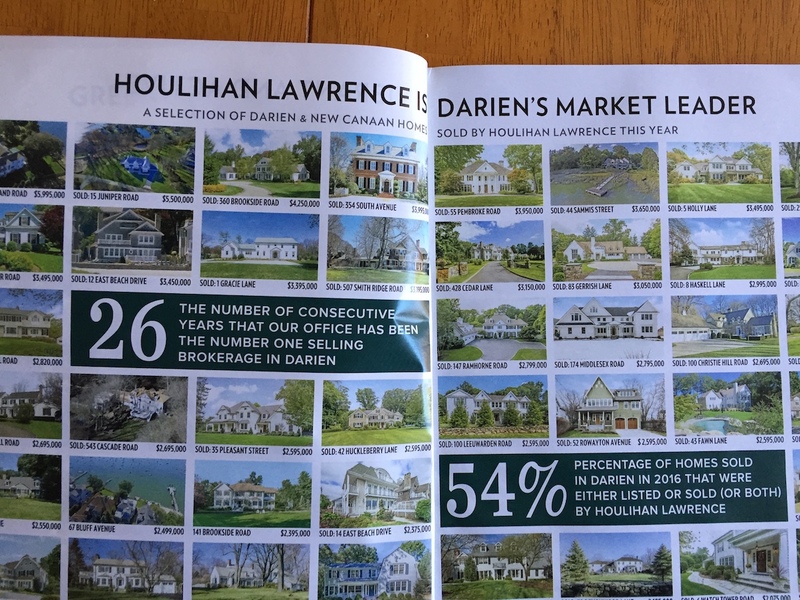 I was reading the newspaper 2 weeks ago and saw that a well regarded area real estate brokerage firm had provided a listing photo magazine insert. I noticed what appeared to be a marketing inconsistency that referred to the Greenwich, CT housing market broker panic of a few months ago. Below is the “We’re #1 in this market” type headline which is common in these photo magazines. “You can’t give away a house in Greenwich,” Sternlicht said Tuesday at the CNBC Institutional Investor Delivering Alpha Conference in New York. The brokerage community in Greenwich was appalled and many took the insult personally, at the risk of propping up sellers to unrealistic expectations they have maintained since 2007. Some agents wanted to write responses in the local papers and have celebrities speak out on how amazing Greenwich was as a residential community. Sadly that type of response completely missed the point. Greenwich is awesome. I have relatives who live there. It is beautiful, close to the commuter trains into the city and has a terrific school system. But that isn’t what Sternlicht was criticizing. A real estate agent’s job is to help their clients navigate a housing market, not lead their clients to believe agents can prop it up artificially (aside from the “glass is half full” orientation) because agents are not bigger than the market. The effectiveness of spinning market conditions to hide actual conditions is a myth. I believe this way of broker thinking actually damages the market by keeping the gap between buyers and sellers artificially wide. Greenwich, which relies on Wall Street for the high end home buyer market, did not see the boom of the past five years that NYC saw. Bonuses being paid out to Wall Street are forecast to be lower this year for the third year in a row. I wrote about this agent-market disconnect in my Housing Note when the Sternlicht article came out. In addition, areas furthest away from the town center have been the hardest hit as more and more new buyers are reflecting the new urbanism call for walkability. 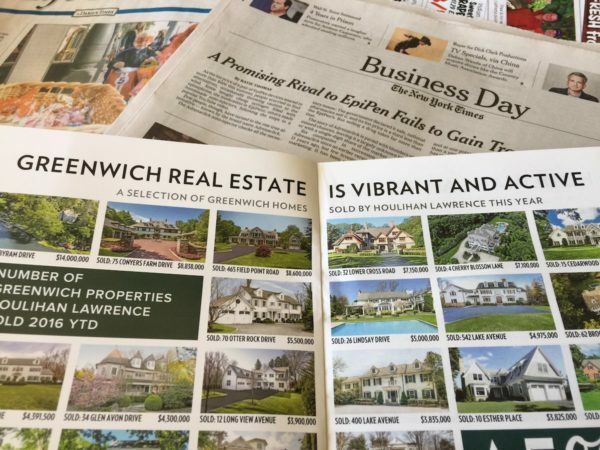 It appears this brokerage firm was attempting to counter Sternlicht’s insult and placate their own agents, by inserting the following awkward headline: GREENWICH REAL ESTATE IS VIBRANT AND ACTIVE in this listing photo magazine insert below. I understand that the results of their market report were almost identical to ours – sales slipped year over year – but less than the size of the prior quarter slip. Incidentally they no longer prominently post their market reports on their web site. I assume they have been removed for a similar reason. Current market conditions are weaker than a few years ago in the areas they service so there is no need to illustrate it. Anyway, that’s only my assumption. The following photo ad even says (you can see the top of the “5%” on the lower right of the photo that says their sales are up 5%. But that factoid does not speak to the market, rather it really speaks about the sales volume of their company. This is misdirection since it contradicts overall market direction. I have long admired this firm and still do so I sent my thoughts about this to a senior executive I know but received no response. I can only assume that this was thought to be a good recruiting tool to attract those agents appalled by the attack on the Greenwich market by Sternlicht. Unfortunately this doesn’t do any market participant any good since real estate brokers are supposed to be trusted advisors. 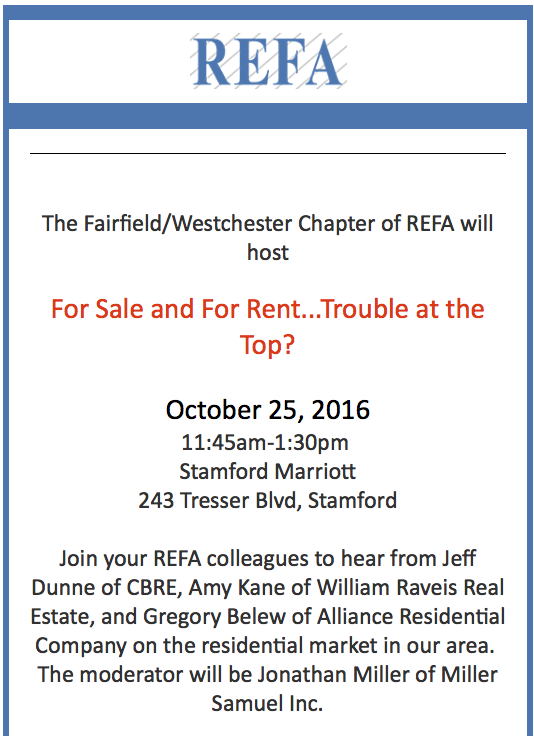 For Sale and for Rent, Trouble at the Top? Residential Real Estate has been one of the bright spots in the local economy in recent years. The single family market continues to post record sales volumes and the growth of the multi-family market in Fairfield County has been dramatic. However, there is mount- ing concern about perceived over-building at the top end of the luxury single family and multi-family markets. Where is the demand coming from? Will it continue? What prod- uct do people want? Where are we headed? We look forward to a lively and informative program. The response so far has been heavy – click here for more information or to sign up. Fairfield County, CT is one of the more recent editions to our Elliman Report series. 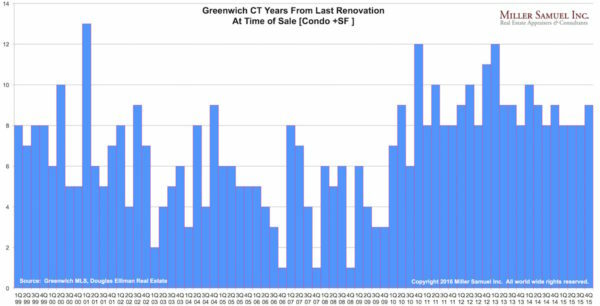 Greenwich, CT as a submarket has proven to be a market still strongly linked to the heady days before the collapse of Lehman Brothers in 2008 and the beginning of the financial crisis. There remain many owners of high end homes purchased a decade ago that remain value-anchored to those days of yore. I took a look at the last 15 years of residential sales, measuring the amount of time that passed from a home’s prior renovation to sale. From the late 1990s to Lehman, there was a compression of time from renovation to eventual sale, reflective of the speculative conditions leading up to Lehman. Reno a home, then sell it. During those days, business cards passed out by doctors and lawyers at Greenwich cocktail parties were either “hedge fund manager” or “developer.” Not so much anymore. Subsequent to Lehman, the late 1990s pattern that preceded the U.S. housing bubble returned by 2010 and has remained remarkably stable since. A few days ago I was interviewed by Christopher Eshleman at the Port Authority of New York & New Jersey. He works for Alexander Heil who is the chief economist and publishes a lot of great regional economic insights. Although this is a new effort, this was their first podcast conducted outside of the institution so I am deeply appreciative of the opportunity to share my views. Christopher is a sharp guy and kept the conversation interesting (I even inserted a Jerry Seinfeld joke). It’s about a half an hour. 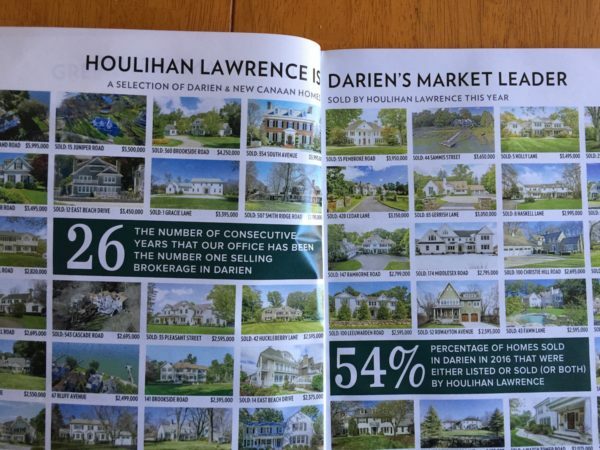 Although I don’t currently report on the Fairfield County, CT market myself, here is an excellent recap of the 2007, 2008 and 2009 (through June) housing market presented by William Raveis Real Estate, who does a great job with their online presentation of MLS stats. I selected Greenwich, Connecticut as the town to be analyzed (I have to select one) given its heavy linkage to Wall Street. County and state trends were also shown. Trends are nearly identical to the NYC, Long Island and The Hamptons/North Fork markets: Marketing time has expanded, median sales price, sales have fallen sharply and rising inventory. The similarity is consistent with many other metro areas based on the credit contraction throughout the country.